McIlroy is looking to win his fifth title of the season. THE EUROPEAN TOUR’S finest have converged on the Greg Norman-designed Earth Course at Jumeirah Golf Estates in Dubai this week aiming to prevent a Rory McIlroy sweep at the season-ending $8 million (6.2 million euros) DP World Tour Championship. There are two trophies up for grabs, and McIlroy has already written his name on one of them. The 23-year-old Ulsterman secured the Race to Dubai crown (European Tour’s Money List) and the top prize in the bonus pool when he finished third in Singapore two weeks ago. That gave him an unassailable lead coming into this week’s season-finale. The focus now shifts to the tournament, with McIlroy having thrown the gauntlet to the field saying his motivation now was to win a fifth title in a season where he has won the USPGA Championship and three regular tournaments on the PGA Tour. He has also won the Money List in the United States and is ranked No.1 in the world. Such has been his dominance that his nearest rival, Sweden’s Peter Hanson, did not even go the extra yard of entering the tournaments in the last couple of weeks and try to close the gap on McIlroy down the stretch. Hanson, winner of the BMW Masters at Lake Malaren in China last month where he beat McIlroy, said: “To be honest, I never had a chance. Rory was almost €900,000 ahead of me and the way he was playing, there really was no way I could have overtaken him, or even made him sweat. “I did discuss it with Justin (Rose, who is No.3 in the race to Dubai) and a few others, and none of us felt we could have challenged him even by adding the last two events to our schedules. But McIlroy, who missed the cut last week in Hong Kong where he was the defending champion, will have to bring his A game this week if he wants to take home both the trophies. Chief among those who can give McIlroy a run for his money are the world No.2 Luke Donald, who won last week in Japan, Europe’s Ryder Cup talisman Ian Poulter (winner at WGC-HSBC Champions and runner-up last week in Australian Masters), Louis Oosthuizen, who was sixth in WGC-HSBC and runner-up in Singapore, and the 19-year-old Matteo Manassero, who won in Singapore and was fourth in Hong Kong. Poulter, who finished fourth, first and second in his last three tournaments after the Ryder Cup, is still riding high on the Ryder Cup euphoria and said: “I am in some pretty good form, so feeling like we can end the year on a very high note. Even though the 60 top players in the 2012 season qualify for the tournament, only 57 are playing this week. Thomas Bjorn, Ross Fisher and Retief Goosen have all withdrawn. The field includes all 12 members of Europe’s victorious Ryder Cup team and five of the top-seven ranked players in the world. However, defending champion Alvaro Quiros of Spain will be absent as he failed to qualify for the tournament. Quiros, who made an unforgettable eagle on the last hole to win in 2011, finished outside the top-60 in the Race to Dubai. Email “DP World Tour Championship: McIlroy seeking double in Dubai”. 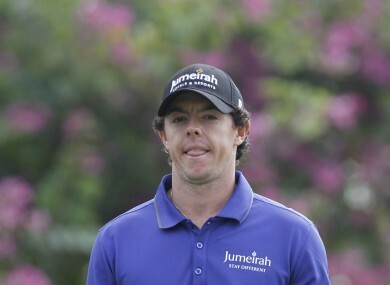 Feedback on “DP World Tour Championship: McIlroy seeking double in Dubai”.